Microsoft announced that it will end all support for Windows 7 on January 14, 2020 (mainstream support has already ended back in 2015 in case you didn’t know). This means that sooner or later, you will need to upgrade your operating system to Windows 10 if you want the data on your computer to stay secure and the software you download to actually work. I used to love Windows 7 for its flexibility and features, but in many ways, Windows 10 is a lot better, faster and easier to use. It’s also more secure (although Windows Defender acts up at times – you can read how to fix Windows Defender problems here). In fact, I can go on about the many ways Windows 10 a better operating system but I’ll save that for another article. For most people, upgrading to Windows 10 is a breeze. Unfortunately, some users encounter various Windows upgrade problems. The worst bit about these problems is that they produce error codes that can be really hard to understand and decipher. In this article, we’re going to cover Windows upgrade error codes 0xC1900101 (there are quite a few codes that start with this string). 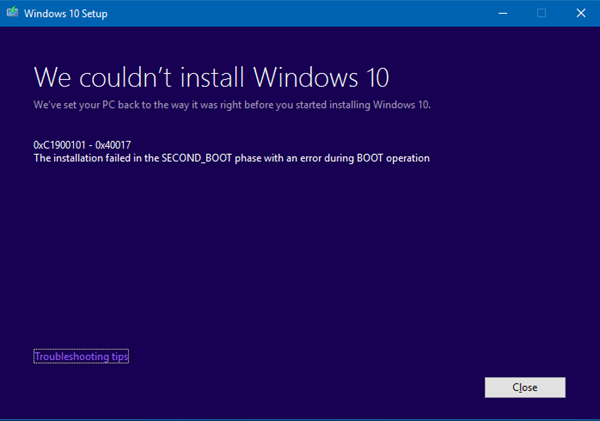 What Causes Windows Upgrade Error Codes 0xC1900101? 0xC1900101 – 0x20004: this is the most general of the above-mentioned Windows upgrade error codes because it’s usually caused by outdated device drivers. To prevent this from happening, go to the Device Manager and update all outdated drivers. If you find it too difficult to do manually, there are plenty of software programs that will update the drivers for you. 0xC1900101 – 0x30018: this error usually occurs when a device driver stops responding to the setup.exe process while you’re performing the upgrade. To fix it, try disconnecting all devices that are connected to your computer if it’s a laptop. If it’s a desktop, only leave the mouse, the display, and the keyboard connected. If that doesn’t help you fix the Windows 10 upgrade problem, try updating all device drivers, install all Windows updates, and try running the upgrade again. 0xC1900101 – 0x2000c: this is another Windows upgrade error code that’s caused by outdated drivers. If updating drivers doesn’t help, try installing all Windows updates and trying again. 0xC1900101 – 0x20017: this is a nastier error code because it happens when SafeOS boot fails. Again, this problem is usually caused by device drivers but it may sometimes be the result of a problem with third-party encryption software. Try uninstalling the encryption software and updating all outdated device drivers to fix the problem. 0xC1900101 – 0x3000D: this code indicates a problem with your display driver. Go to the manufacturer’s website and download the latest version of the driver, then install it, reboot your PC and run the upgrade again. The error should be fixed. 0xC1900101 – 0x4000D and 0xC1900101 – 0x40017: these Windows upgrade error codes also occur because of driver problems and rollbacks. Performing Clean Boot usually helps to fix them. You can read how to perform Clean Boot in this Microsoft article. I hope that this post helped you to understand driver-related Windows upgrade error codes and fix the problem by simply updating your device drivers.